Dolly's "I Will Always Love You" showed up on television twice Monday night. First, a contestant on NBC's The Weakest Link answered correctly which country star wrote the Whitney Houston's mega-hit, and then Houston's version was ranked No. 15 on the fan-voted best tearjerkers of all time on VH1's What's My 20. However, VH1 made a couple of mistakes. First, they said Dolly had a country hit of the song in 1973 (it was 1974, although she had subsequent hits on it in 1982 and 1995) and that she wrote the song while going through a divorce (she wrote it about dissolving her duet partnership with Porter Wagoner; she's been married to the same man, Carl Dean, for 35 years). Little Sparrow inches up one notch to No. 7 on the British country albums chart, released Sunday. Currently in its 27th chart week overseas, the CD peaked for two months at No. 1. Also, Trio II drops two places to No. 18 on the country albums chart. In its 36th chart week, the CD is back in the top 20 for a fourth week in a row more than two years after it peaked at U.K. country No. 3. Train's "Drops of Jupiter" over the weekend entered its ninth week at No. 1 on the Canadian pop singles chart, tying the record held by Kenny and Dolly with "Islands in the Stream" (late 1983 through early 1984) and Corey Hart with "Never Surrender" (1985) for the longest time spent at No. 1 up north. The Tennessean on Friday had a great little article on Hank Locklin and his new CD, Generations In Song, which of course features Dolly dueting on his classic "Send Me The Pillow That You Dream On." Read the story here. The Associated Press released a story that was published in newspapers across the country this weekend about a unique Russian internship program operating at Dollywood and a few other businesses in the Pigeon Forge-Gatlinburg area. Read it in The Tennessean here. Little Sparrow goes up four spots on the Aug. 4 Billboard country albums chart released Thursday, coming in at No. 50 in its 26th chart week. Also, the Songcatcher soundtrack moves up one spot to No. 42 on the country albums chart in its fifth chart week. The soundtrack CD, which features the beautiful Dolly and Emmy Rossum duet "When Love Is New," also drops four notches on the independent label albums chart to come in at No. 47 in its third week on that chart. Dolly's video for "Shine" moves up two places to No. 18 on CMT's weekly top 20 countdown, it was announced Wednesday. The video debuted last week at No. 20 after five weeks as a "Hot Shot" video on the network. And remember to keep voting for the song on CMT's Most Wanted Live here, CMT's Labor Day Top 100 here and GAC's Top 15 Countdown here. When I opened the Aug. 6 issue of the financial periodical Forbes on Wednesday, I was taken by a series of three photos on the table of contents page. They showed a woman, dressed in white and carrying a guitar, entering a stage with a quote below it reading, "People always want to come back to the real stuff. 112." My first thought was, "That sure looks like Dolly, but what would she be doing in Forbes?" The photos were a little fuzzy, so I couldn't be sure. I turned to page 112, and there was an article in the Lifestyle section titled "Twang of Nostalgia." At the top of the page was a large photo of Dolly (from behind) entering the stage at MerleFest in April (if you missed it, catch Dollymania's first-hand coverage of the festival, complete with exclusive, original photos here!). The article centered on the resurgence of roots music in the country field, particularly bluegrass, noting Dolly's quote from above and adding, "The revival has swept along Dolly Parton, who recently reinvigorated her stalled career by recording two bluegrass albums of her own, one of which won a Grammy." You may view the story (alas, minus the photos) online here, but you must first register with the site. Loyal Dollymania reader Greg contacted his local PBS affiliate this week to ask if they will be airing Dolly's episode of Austin City Limits, as the original April broadcast in Los Angeles was pre-empted for special fundraising programming. The response from KCET was that there are currently no plans to broadcast the show, although most PBS stations nationwide will be airing the repeat on Sept. 15. If you live in the L.A. area and want to voice your opinion to KCET, e-mail them at viewerservices@kcet.org. Thanks, Greg! The New York Post finally got around to noting in a story Wednesday that Dolly will not be appearing in Annie Get Your Gun on Broadway. The article about the show notes that producer Barry Weissler has attempted to get Dolly, Melissa Etheridge and Naomi Judd each to take over the musical's title role, and all three have declined. As you may recall, the Post reported last month that insiders expected Dolly to take over the role later this year. That story was never retracted, even though Broadway.com said it was a completely untrue rumor. Bob Ferguson, legendary songwriter and record producer, died Sunday at University of Mississippi Medical Center here in Jackson where he was receiving treatment for cancer, it was reported Monday. He was 73. Ferguson ran RCA Records' Nashville operations with Chet Atkins during the label's heyday, with the two signing Dolly and several other of the record company's top acts. He was also credited with producing all of Dolly's RCA material from 1968 through 1975, (although Porter Wagoner produced or co-produced most of it uncredited). Ferguson and Atkins were the "Chet and Bob" referred to in Dolly's 1973 classic "Down on Music Row." Ferguson's death follows just three weeks after that of Atkins, whose records he also produced. Dolly recorded her own versions of Ferguson's two biggest songwriting hits: "Wings of a Dove," originally a No. 1 for Ferlin Husky, appeared on her Golden Streets of Glory in 1971, and "Carroll County Accident," originally a No. 2 for Porter, was on her In The Good Old Days (When Times Were Bad) in 1969. For the past several years, Ferguson had lived with wife, his two sons and one of his daughters on the Mississippi Band of Choctaw Indians Reservation in Philadelphia, Miss. Services will be held at 10 a.m. Wednesday at Pearl River Baptist Church on the reservation. Milling Funeral Home of Union, Miss., is handling arrangements. Read the story in The Clarion-Ledger here, The Tennessean here or country.com here. Our condolences are extended to his friends and family, who are in our prayers. Little Sparrow and Trio II both remain steady on the July 22 British country albums chart, coming in at No. 8 and No. 16, respectively. Sparrow, in its 26th chart week overseas, peaked at No. 1 country for eight weeks and No. 30 pop. Trio II, in its 35th chart week, peaked at No. 3 country about two years ago. Rolling Stone reported Friday that Ralph Stanley's new duet album, Clinch Mountain Sweethearts, which will feature Dolly on "Loving You Too Well," is scheduled to hit stores Sept. 25. Others joining the 74-year-old banjo picker include Pam Tillis, Iris DeMent, Gillian Welch, Maria Muldaur, Joan Baez, Chely Wright and Lucinda Williams. Read the full article here. 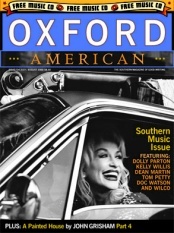 Oxford American's Fifth Annual Southern Music Issue came out last week, and concerning the Dolly song included on their companion CD ("Seven Bridges Road" from Little Sparrow), they note: "Dolly was on last year's CD, and of course we would never, ever put an artist on the OA CD two years in a row. But it's not like we had any say in the matter. The song just took hold of us and wouldn't let go. Case closed." The magazine also features a Q&A with Dolly about the song in which she talks about how much she's loved it since it first came out in the early '70s, how she always heard men singing it and thought the harmonies would sound great with female voices, and that composer Steve Young liked her version of it, which she said she "Dolly-ized." Dolly also gets a mention in an article on the O, Brother Where Art Thou? soundtrack and a piece on pal Emmylou Harris. The magazine is on newsstands now. US Airways' official magazine, Attache, gives a hand to Dolly in an article titled "Cool Tunes For The Dog Days" by Robert Sullivan. He writes: "Dolly Parton's two most recent discs, the Grammy-winning The Grass Is Blue and this year's follow-up, Little Sparrow, are pure bluegrass albums, a welcome change from the overproduced pop of her platinum days. Parton has always had a beautiful voice, and now, with a superb backing band, she renders this material sensationally." The author hints at his more contemporary audience to "Trust me on this." Accompanying the article is a photo of several CD covers (including Sparrow), which also graces the title page of the magazine. Thanks, Solomon! If you missed Dolly's awesome performance on Austin City Limits, PBS has scheduled a repeat of the concert, which also featured Nickel Creek, for 9 p.m. Eastern Sept. 15. Remember, though, that local air dates and times will vary by station, so check your local listings for an exact time. And if your local PBS affiliate is not planning to air the show, contact them and ask them to! A country.com article on Reba's Girls Night Out Tour (here) notes that it could become an annual tour with a revolving line-up of performers. It also gave a mention that Dolly would be a good candidate to include in a subsequent tour. Thanks, Brenda! According to the Associated Press, Dolly is among several celebrities who will participate in episodes of the new season of Cool Women, a series on WE: The Women's Entertainment Channel, which profiles ordinary women with extraordinary accomplishments, such as a 19-year-old race car driver and a women who makes hats for cancer patients undergoing chemotherapy. The series is produces by Debbie Allen and makes its season premiere July 25. Little Sparrow remains steady on the July 28 Billboard country albums chart released Thursday, coming in again at No. 54 in its 25th chart week. Also, the Songcatcher soundtrack shoots up four spots to No. 43 on the country albums chart in its fourth chart week. The soundtrack CD, which features the beautiful Dolly and Emmy Rossum duet "When Love Is New," also moves up seven notches on the independent label albums chart to come in at No. 43 in its second week on that chart. The release date for Hal Ketchum's upcoming CD Lucky Man, featuring the Dolly duet on the Sherrie Austin composition "Two of The Lucky Ones," has again changed, Curb Records announced this week. The release has moved up to Sept. 4, three weeks earlier than the previously announced Sept. 25 street date. The CD had originally been scheduled for a May 8 issue, but Curb withdrew those plans without explanation just two weeks before it was to be released. Reserve your copy here! Little Sparrow slips one spot to No. 8 on the British country albums chart, released Sunday. Currently in its 25th chart week overseas, the CD has spent about the past two months at No. 7, after peaking for two months at No. 1. Also, Trio II drops three places to No. 16 on the country albums chart. In its 34th chart week, the CD is back in the top 20 for a third week in a row more than two years after it peaked at U.K. country No. 3. Dolly had a great profile on this weekend's World Beat on CNN. As the show's "Inside Track" story, they showed footage of her recording the song "Little Sparrow", filming the video for "Shine" and performing on Austin City Limits. Lee Ann Womack spoke of what a "huge influence" Dolly was on her, and Brad Paisley noted, "Dolly probably doesn't realize the impact she has had," adding that he believes she is making the best music of her career now. The profile also included footage of Dolly's induction into the Country Music Hall of Fame in 1999 and last month's induction into the national Songwriters Hall of Fame, showing Emmylou Harris presenting Dolly with her membership plaque. Dolly spoke of the "Blue Mountain" style of Little Sparrow, her upbringing, the highlights of her career over the decades (the first time she performed on radio, her first Opry performance, becoming a member of the Opry and, her most cherished honor, induction into the Songwriters Hall of Fame) and the reluctance of country radio to play older artists. They also played snippets from both Collective Soul's original version of "Shine" and Dolly's cover to emphasize the difference between the two as Dolly told of how she came to record the song. The show began with the host noting that on that episode they were profiling "two divas" who are very different but have one thing in common: They're instantly recognized by just their first names � Janet (Jackson) and Dolly. Also profiled on the show was Travis. Little Sparrow moves up four places on the July 21 Billboard country albums chart released Thursday, coming in at No. 54 in its 24th chart week. Also, the Songcatcher soundtrack shoots up 13 spots to No. 47 on the country albums chart in its third chart week. The soundtrack CD, which features the lovely Dolly and Emmy Rossum duet "When Love Is New," also debuts on the independent label albums chart at No. 50. A great ad shows up in the August issue of OUT magazine. It proclaims: "A Paid of Doozies: You can never get too much Dolly!" Then, beneath photos of the cover art for Little Sparrow and Songcatcher, blurbs are printed from the rave reviews both CDs got in Rolling Stone, Billboard, Entertainment Weekly, The Los Angeles Times and Elle. What did Dolly do during her private tour of the new Country Music Hall of Fame building in Nashville a few weeks back? She stood alone in the building and performed an a cappella version of "Wayfaring Stranger" to the walls "just to add her voice" to the building, according to a nice, little story on the Hall of Fame in Monday's Knoxville News-Sentinel. They also note that she sent her hairdresser back to her exhibit in the hall to "perk up her wig a little." Read the full story here. An interview with Dolly will be featured on the July 15 edition of CNN's music program World Beat, it was announced Monday evening. Also scheduled for the episode are Janet Jackson and Travis, according to CNN.com. By listing only those three names, the site suggests that Dolly's segment will be one of the main portions of the show. The half-hour show airs Sunday at midnight Eastern (11 p.m. Saturday Central time), with a repeat at 3:30 p.m. Eastern (2:30 Central). Dolly got a couple of mentions in an article in Monday's USA Today about the resurgence of mountain music popularity. In addition to the successes of the O, Brother Where Art Thou soundtrack, Nickel Creek and Mark McGuinn, the story noted the popularity of Dolly's "Shine" on CMT and that her last two roots-infused albums (Little Sparrow and The Grass Is Blue) have sold more than 200,000 copies each (which must be worldwide sales totals, because as of the last count I had seen, each CD had sold about 150,000 units in the U.S.) CMT vice president for music and talent was quoted saying: "I don't want to overestimate the magnitude of what is happening, but it certainly feels like there is a huge groundswell out there." Read the full story here. And While You're Voting . . . While you're casting your ballots for Dolly's "Shine" (here for CMT's Most Wanted Live and here for GAC's Top 15 Countdown), take a moment and vote for a Dolly video in CMT's labor day Top 100 countdown. You may vote here once every 24 hours. Little Sparrow remains steady one more week at No. 7 on the British country albums chart released Sunday, marking its 24th week on the chart. It had peaked at No. 1 country there for eight weeks, No. 30 pop. Also, Trio II returned to the U.K. country albums chart last week at No. 13, and it remains in that spot this week, giving the CD its 33rd chart week overseas. Dolly's second outing with Linda Ronstadt and Emmylou Harris had peaked at No. 3 country two years ago. The Boston Herald on Friday offered a glowing review of the Songcatcher soundtrack, specifically noting that Dolly, "especially, knows her way around a song. Her duet with the young Emmy Rossum (who also does an a cappella verse of 'Barbara Allen') is more than welcome." It opines that while the instrumentation on most of the cuts is more modern than the film's 1907 setting, "the voices are beautiful and the music properly evokes blue mountains and shaded hollows." Read the full review here. Little Sparrow falls eight places to No. 58 in its 23rd chart week on the July 14 Billboard country albums chart released Thursday. Also, the Songcatcher soundtrack, which features the Dolly and Emmy Rossum duet "When Love Is New," drops three spots to No. 60 in its second chart week. Sugar Hill Records announced Thursday that the official "add date" for Dolly's "Shine" will be Monday. That's the day the label asks radio stations to begin playing the song as a single, even though it was actually shipped to radio several weeks ago and has gotten very limited airplay in some markets, but not enough to chart. So everyone call your local country stations and demand they play it! Also, CMT announced Wednesday that the song this week is one of the network's four "Hot Shot" videos, making it the fourth week in a row Dolly has received that designation. Although it's not on the network's official chart, the video was the second-most played on CMT last week according to Billboard. (Remember, go vote daily for the video on CMT's Most Wanted Live here and GAC's Top 15 Countdown here!) Thanks, Jennifer! Of course, that's a line from Dolly's first country chart single, 1967's "Dumb Blonde," and Dolly got a couple of mentions in Thursday's The Tennessean in an article on National Blonde Day. In addition to several dumb blonde jokes, blonde facts and comments on the new film Legally Blonde, they cited one of Dolly's famous quotes: "I'm not offended by all the dumb blonde jokes because I know I'm not dumb and I'm also not blonde." She was also featured in a list of "Smart Blondes," which included Supreme Court Justice Sandra Day O'Connor, Senator Hillary Rodham Clinton, Barbara Walters and Martha Stewart, among others. Read the full article here. According to Entertainment Tonight on Thursday, Dolly says her breasts are not insured for nearly half a million dollars, as had been reported several months ago on VH1. Thanks, Hartman! Dolly will make a second appearance in the annual Southern music issue of Oxford American, officials with the magazine to highlight the best of Southern writing announced Tuesday and Dollymania is pleased to be the first to report. Every year for the past five years, the magazine staff has profiled the best of Southern music, focusing mainly on lesser-known artists, often on the fringe, complete with a companion CD packaged with the issue. Last year, they chose to include Dolly's "Silver Dagger" from The Grass Is Blue, and for the 2001 issue, they will feature Dolly's "Seven Bridges Road" from Little Sparrow. Officials with the magazine, which is published by author John Grisham in Oxford, Miss., said this is the first time they have ever featured the same artist on the CD for two consecutive years and that Dolly's version of the classic song "was too good to pass up." Other cuts include Billy Bob Thornton performing "Ring of Fire" and Earl Scruggs and Bob Dylan on "The Lonesome River." A portion of proceeds from the award-winning annual issue benefit the charity Music Maker. Alas, Dolly will not appear on the cover this year as she did in the 2000 issue (photo at left). The magazine should hit newsstands within the next couple of weeks. On the morning that Music City was preparing to lay Chet Atkins to rest, they learned another country music legend had passed away. Grand Ole Opry member Johnny Russell died from complications related to diabetes Tuesday morning at a hospital outside of Nashville, The Associated Press reported. He was 61. Russell was best known for writing "Act Naturally," one of the biggest hits of Buck Owens' career and also a B-side single by The Beatles. Perhaps the second-biggest success of his career was writing "Making Plans," which Dolly recorded three times. She and Porter took the song to No. 2 on the country charts for two weeks in 1980 (available on The Essential Porter & Dolly). She recorded it again with Linda Ronstadt and Emmylou Harris for 1987's Trio, and a third time as a duet with Russell himself on his final album, last year's Acting Naturally. Visitation for the Moorhead, Miss., native will be from 5-9 p.m.Thursday at Cole & Garrett Funeral Home in Hendersonville, Tenn. Services will be held at 11 a.m. Friday at the Grand Ole Opry House in Nashville. Dollymania on Monday passed 150,000 visitors to its front page (visits to the front page only are counted so as to not artificially inflate the numbers)! Thanks to all who've stopped by and all who return. Also on Monday, Dollymania returned once again to the No. 1 spot on the vote-based links page at AboutDollyParton.com. Thank you for consistently taking Dollymania, the only site to receive votes for about the past three weeks, back to No. 1 each time it slips to No. 2! You may cast your votes here. Dolly has been named an honorary pallbearer at funeral services for music legend Chet Atkins, according to his obituary in The Tennessean. Garrison Keillor will deliver the eulogy, according to country.com, and musical tributes will be performed by Vince Gill, Steve Wariner, Paul Yandell, Marty Stuart, Pat Donahue and a string quartet. Services will be held at 11 a.m. Eastern today (Tuesday) at Nashville's Ryman Auditorium. Scheduled to speak during the services are Eddy Arnold and Kevin King. While no plans to televise the proceedings had been announced as of press time Monday night, it is scheduled to be broadcast live on Nashville's WSM-AM 650. Back in March, while Chet was ill, Dolly was one of several stars who wrote down their feelings of Chet for his website. You may read her note here. Active pallbearers are Gary Atkins, Ray Stevens, Vince Gill, David Conrad, Steve Wariner, Jonathan Russell, Dr. Will Russell, Chad Sawyer, Paul Yandell and Harry Warner. Honorary pallbearers with Dolly are Joe Allison, Harlan Howard, Mike Volz, Robert K. Oermann, Shirley Welch, Blake Chancey, Pat Bergeson, Porter Wagoner, Dr. Joe Robertson, Bill Carlisle, Les Paul, Chaddy Baker, Tommy Emmanuel, Jerry Reed, Don and Phil Everly, Bob Beckam, Billy Edd Wheeler, Charley Pride, Don Gibson, The Browns, Dr. Mark Pritcher, Suzy Boguss, Bonnie Taggert, Mark Knopfler, Dr. Frank Gluck, Johnny Burns, Boots Randolph, Bob Ferguson, Paul Craft, Ed Benson, Bill Ivey, John Knowles, Garrison Keillor, Daryl Dybka, Dan Evans, Norro Wilson, Kevin King, Kyle Young, Francis W. Preston, Harold Bradley, Joe Galante, Waylon Jennings and Henry Juskiewicz. Gifts in Atkins' memory may be made to Alive Hospice, 1718 Patterson Street, Nashville, TN 37203. Little Sparrow remains steady for yet another week on the British charts, holding at No. 7 on the U.K. country albums chart, where it is in its 23rd chart week. The CD peaked overseas at No. 1 country for eight weeks and No. 30 pop. Chet Atkins, renowned guitarist and country music legend, died at his home in Nashville Saturday morning, The Associated Press reported. He was 77. Services will be held Tuesday at the Ryman Auditorium. The most-recorded solo instrumentalist in music history, the 14-time Grammy winner was considered one of the most influential guitarists in modern music, cited as a hero by almost every major guitarist of all musical genres for the past half-century. Atkins became a member of the Country Music Hall of Fame in 1973 at age 49, the only person to be younger at the time of his induction than Dolly and Loretta Lynn, who both joined at age 53. As the former head of RCA Records Nashville, Chet had a major role in the careers of legends ranging from Roy Orbison to Elvis Presley, and he even signed Dolly in 1968 at the urging of Porter Wagoner. The three often joked about his reluctance to do so, saying he originally didn't like her voice. Over the years, Chet and Dolly became good friends and collaborators. He performed on several of her albums, and she recorded her own "Do I Ever Cross Your Mind" as a duet on one of his albums and as a trio with him and Randy Travis on Travis' Heroes and Friends. They even had a running gag for several years during which he was "suing" her for sexual harassment for pinching his behind, to which Dolly would retort that it should be "sexual his-assment." Coincidentally, Image Entertainment on Tuesday is scheduled to release on VHS and DVD Chet Atkins: A Life In Music, the TNN special which aired a year ago and features Dolly throughout. Thanks, Robert! To order your copy, click here. At the time the special first aired, Dolly noted about her friend that he "helped out a lot of younger artists and spread a lot of gold dust around the world." Our prayers are with his family and friends. I've just learned that Porter Wagoner's website, www.porterwagoner.com, has a videotape available of the best of The Porter Wagoner Show, including many appearances by Dolly. Apparently, it is expected to be part of a series, as this tape is titled Volume 1. Thanks, Robert! Get Those DVD Players Ready! Remember, Dolly's Lifetime original film Blue Valley Songbird comes out on DVD and VHS Tuesday. Get your copy here! Those who pre-ordered the title from CDNow should receive it any day now, as most advance orders were shipped Friday. This is Dolly's fourth DVD release. The others are 9 to 5, Steel Magnolias and Unlikely Angel.